Tell us about yourself and where you have come from? I created and handle all marketing for my product, The Hangover Cure. I am 25 years old and my supplement company is based in Dallas. I’m having a blast growing my brand every single day of my life since its creation. Where did the idea for “the hangover cure” come from? 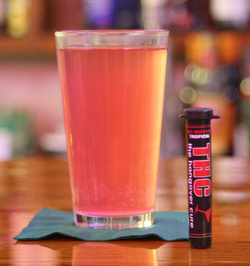 Like any great invention, the idea for The Hangover Cure came about out of necessity when I was in college at Texas Tech University. It seemed like a pretty logical fit for college kids and yet there really wasn’t anything on the market at the time like it, and this was in 2003, before the functional beverage craze I see now was even on the horizon. To give you an idea, no one came up to me on a Saturday morning in the dorms and recommended an existing product to me after a rough night, and that struck me as odd. So while I didn’t act on the idea at the time, the wheels started turning several years ago in college. I just knew that if marketed right, a product like mine would find an audience. What is the company story – when did it start, where, how many people? From 2005 to 2009, I spent a lot of time doing scientific and very unscientific testing to create the formula that became The Hangover Cure. I say scientific testing because yes, I did have to research what causes a hangover and read up on proposed remedies from around the world. And obviously the unscientific testing came in the form of my friends and I trying various homemade concoctions until we were satisfied with the results, which sounds much cooler in theory than it really was. It’s not fun mixing bourbon and champagne all night, that’s all I’m going to say. I worked for IBM out of college here in Dallas and put my idea on the backburner in favor of climbing the corporate ladder. I officially formed an LLC earlier this year after being laid off during the recession. What pushed you to go after this idea? I feel like a lot of people have thought it would be great to create “the hangover cure” but few actually do it. I knew the formula I had created and perfected worked well. That was obviously step one. It’s almost impossible to sustain a consumable product if it doesn’t work as intended, you need that loyal fan base. I mean if Red Bull made you drowsy, it would have never gotten off the ground. I had been kicking around the idea of starting my brand full time for years while doing the corporate thing, and when I was laid off from my ‘real’ job in January of 2009, I figured there was no point in putting it off any longer with the amount of free time I had suddenly and unexpectedly been given. My options were basically to find another mundane office job or try to grow my own brand, and I didn’t want to wake up when I was 40 and regret not taking a chance to do my own thing when I could have. The Hangover Cure is a product. Could you describe the process for developing and producing it or any product? I need to protect my intellectual property on this one but I will say that one of the biggest misconceptions I had coming out of school was that a company has to control the production of its product, which to me meant getting a loan to open a factory and hiring workers, which scared the hell out of me. There are plenty of companies online in virtually any industry (I can only speak for the supplement industry from personal experience) that can manufacture anything you need. And that’s how you know when you have found a good contract manufacturer, you ask them what they are capable of and they tell you “anything.” Work with companies like that. Contract manufacturers typically have an in-house design team as well that can help you with branding and package design, if you aren’t the marketing type or need some help with a product name. My suggestion would be to Google your idea in a manufacturing context to see what’s available, that’s what I did starting out. Any tips for someone looking to create a product? Any mistakes to avoid? Keep every aspect of your brand as simple and clean as possible, no matter how creative you are. Being overly clever or creative only confuses people. I admire brands like vitaminwater. It’s pretty easy to figure out what their product is all about in a split second because of the name. It’s water with vitamins in it. Same goes for 5 Hour Energy. Note that these are both best of breed in their respective markets and both were built without traditional marketing by small companies; there is a reason for this. Everyone is so busy these days that you really only have a second or two to get your product’s purpose across to them. Whether someone needs my product or not, calling it The Hangover Cure gets the point across. The same can be said for your sales site. Make it as easy as possible for people to buy online. A potential customer should be able to glance at your homepage and understand it. That means avoiding Flash and not being too wordy. If someone is looking for info about your product, they will seek it out on their own. But someone might read a good blog write up on your product and want to go immediately to your website and buy without needing any further info. Tailor your sales site to them. Keep everything above the fold geared towards those buyers. And have a voice when you write copy. I’d rather offend some while inspiring others than just be vanilla and try to capture everyone’s interest, it’s not possible to be everyone’s friend. What is your marketing strategy? Anything in particular that you have had a lot of success with? One of our first big breakthroughs came from Thrillist, who gave our marketing a glowing review on their site, which generated a ton of free buzz for us. I think their exact words were something about how our marketing’s “awesome dumbness is revolutionary.” This was validation for me I basically wanted to create a product that I would want to buy as a consumer. And I think that’s important. If you create something you like and it fails, at least you know you were honest with yourself. If I listened to other people and used a different product name and didn’t follow my gut and it failed, it would crush me. So I guess if you control the marketing of your brand, do what you know and you will be successful. Don’t try to be anything you are not; customers respect honesty. We have such a tremendous advantage over traditional marketers because I can do off-the-wall ideas and not have to answer to anyone or get approval for anything. I do what I would like to see as a consumer, and that’s the key. What has been the hardest part about starting this company? Surviving that first three or four month period when I was planting seeds just hoping they would start to grow interest in my product. Nothing happens overnight and it’s easy to get discouraged. It was especially hard for me because like I said, I had just been laid off at the time and it was easy to get down on myself when the phone wasn’t ringing and my inbox was empty and I didn’t have another source of income to fall back on. What advice do you have for someone thinking about starting their own company? Do it. Right now. Seriously, if you don’t do it, someone else will, so stop reading this and go fill out a DBA. Or form an LLC. Tonight. Don’t be the guy sitting on the couch complaining about how you had the idea for the Snuggie five years ago and never acted on it and now some other company is making bank off it. Start a company and fix it as you go, nothing is perfect and you will make mistakes. As long as you learn from them and make changes accordingly, you will have success. But you have to take that first step and I know it sounds like a lot of work and it is, but that’s what has to be done. It’s that simple.